The weather changed again - it must be that time of the year. 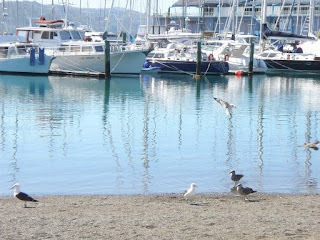 Here is the last of our Wellington trip - amazing how time flies when you get back home. We didn't get to the exhibition opening as we were still up in the Cuba Street Mall having coffee at 5.30pm but we did call into Galleryspace to catch up with Michelle and her lovely silk threads and got to see things then. 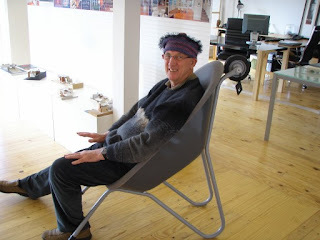 Ian was rather taken with this chair - much better than its real use he thought or maybe he was resting his weary bones! 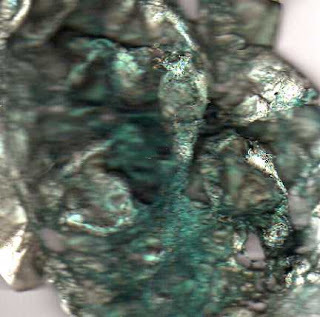 Enlarge the pic and you can see what it is he is sitting in. Rather clever. One thing we thought pretty exciting at the airport is that one is now responsible for oneself - you check your own luggage in and no need to check in at a counter and if you cheat and your luggage is too heavy, then it simply doesn't go. Because we were checking in international we still went through the normal check-in but we loved this and spent some time working it all oout and watching other people in action. 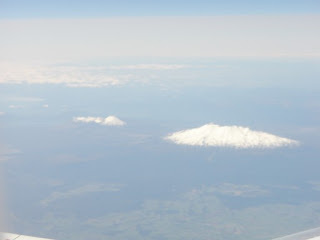 Mt Ruapehu and Tongararo on the way to Auckland looking a little like apparitions in this photo. When we flew from Auckland back to Perth we flew much further south than ever before - over Hobart - this was becasue of the strong winds - probably the ones which sent all that red dust to the eastern states. to answer a few questions - yes my Let's Play booklets will be available worldwide - from us and also from lovely businesses who wish to buy them wholesale and spread the good oil. The first one has gone to the printers - I was rather ambitious in imagining that the second one would be ready but it isn't far off - I have been doing all sorts of exciting things with the Moonglow Sprays and just loving them more and more. I like things to be simple. I won't show any yet though - keep you in suspense. I have also started work on three others but keeping the topics a secret until I am closer to finishing them. Where are we going after London this year? Well - it should really be somewhere new but then Ian just loved that train ride - so we are off to Paris again - staying in Le Marais this time so we know we will get to do all sorts of things we didn't get to do last year. The London boxes all went today - it's so hard trying to decide what to take and not taking too much. I had to make a decision on the number of sprays I could take - I will have all three different ones - so I hope they are well received. Tomorrow I am working exclusively on Lines and I also have 4 more little pieces to make for my pommie bags. And of course the newsletter. Doesn't time just fly? It has been an absolutely glorious day in Perth today - when I went for my walk at 6am it was crisp and I needed my possum gloves but then it turned out to be brilliant. Ian and I have been slogging away indoors - Ian working on getting the first of my Let's Play booklets ready to go to the printers - the second one will be ready when we get back from London and I have started on the third one. 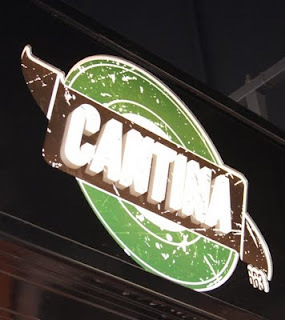 I have been packing boxes for London and when we got tired of all this especially because it was such a lovely day, we went up to Cantina for some lunch - beautiful food - good grazing stuff. Then we came back to carry on. 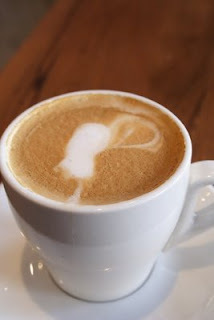 I have three more Lines topics to post to the Holey Moley Club pages - three lots of things in different stages. I hope they will forgive me for being slow but they will all be loaded sometime this week. It's a holiday here tomorrow - Queen's birthday - I thought we had already had this a couple of times this year but apparently not. And daylight saving began in NZ this weekend - you must remember that this little pleasure has been denied to us in the west and it is already light at a ridiculous hour and will only get worse. Then we must realise that we will be denied our lovely long evenings in the garden. 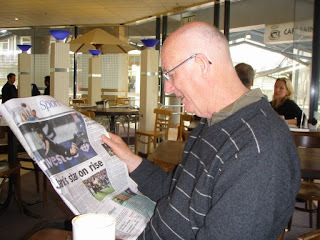 I know it has been dreadful since we flew out but last Sunday was the most glorious day - it can't have just been because the All Blacks won surely... Ian was enjoying reading about it in the Dominion Post - Corey Jane's fabulous try. We spent the morning roaming around areas we hadn't been to for ages and had breakfast at Sweet Mother's Kitchen in Courtney Place - extremely 70s but the food was excellent and it was very busy. 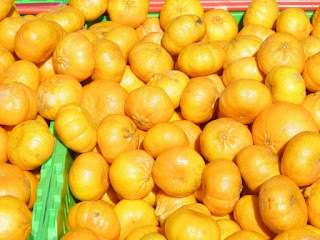 Then we went to the farmers markets on the wharf in the car park by Te Papa - pity we couldn't buy anything much other than a couple of these oranges. We also popped into the hotel museum on wheels to have a look at the art and the toilets - I was going to take a pic but got interrupted. I sent Ian into the men's to check it had the same set up. Very decadent. 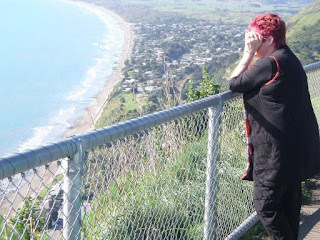 Then we went over the Haywards and down into Paekakariki on the old road. 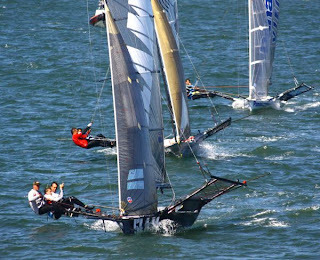 It is a long time since I have done that and a new experience for Ian. the weather being glorious meant we had super views of the South Island and the sea was a mill pond. 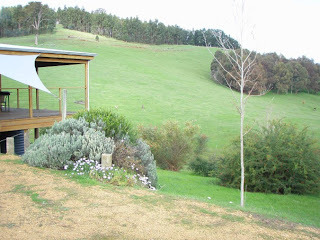 Then we went to visit some old friends in Waikanae and back to Ken and Raylene's in Pukerua Bay. In Perth today it is also glorious. 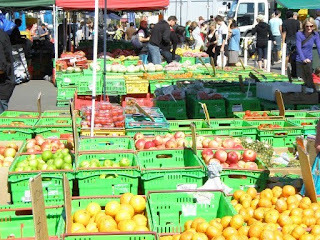 Don't forget if you are going to Geelong Forum (watch out for the victorious footy fans though), to go and see Rae and Jacinta - they don't trade in the traders hall but in their own space - you will find them! doesn't a week simply fly? 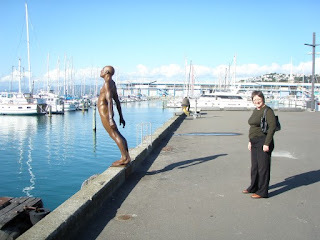 It's a week since we went to Wellington and here we are back into the swing of things here - I am very busy packaging stuff and packing the boxes for London along with squeezing in a variety of other urgent tasks. 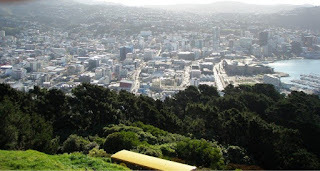 Here is Wellington again from the top of Mount Victoria. You could take loads of photos all over. 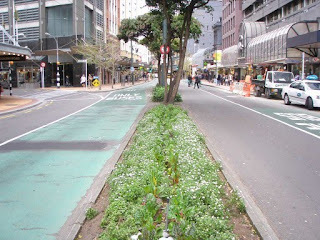 Silverbeet growing in Lambton Quay - amazing! We were on our way to Kirkaldie and Stains so Ian could buy new corduroys - it still has the same charm - the man at the door and the delightful chap who served us. The door to Maria Pia's - I think we were a bit lucky being so close to 2 great eateries - we were staying just behind this one in St Paul's apartments. 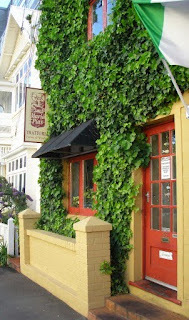 And of course The Thistle Inn - the oldest hotel in Wellington - all decked out for the game. We booked a table for after the game and when we got there of course it was packed to the gunnels with happy fans - our table was there snuck right in the corner much to the amusement of the punters. One chap serenaded us with a Tom Jones song - Delilah. The service was great and the food not bad either -I am sure we were the only people eating! and some activity on the field. All in all a great long weekend. But more to come so watch this spot. In the meantime it's back to work. 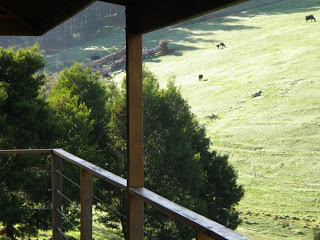 We had a fabulous long weekend and I have the feeling that the weather was better in Wellington than in Perth. Here are a few pics of day 1. 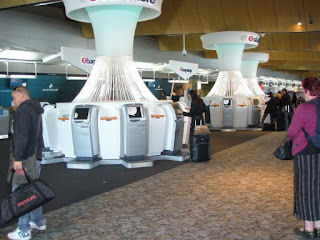 We arrived in Auckland well before 6am but it is much better to fly over night with Air New Zealand rather than Qantas because Q don't fly direct. 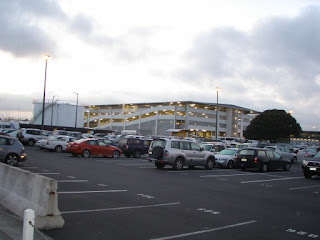 Then you walk from International to Domestic - here is the car park on the way. It's good to have this walk after sitting on a plane for so many hours. 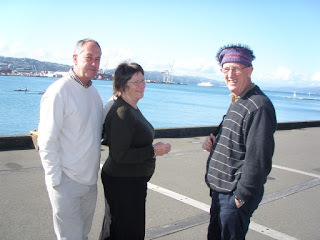 After our little catchup nap, Ken and Raylene collected us and we spent a few hours and luch down on the Wellington wharf. 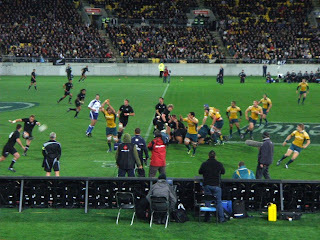 It sure has come a long way from when we were lviing in Wellington. You can see it was a beautiful day. A great statue by the water. I forget who did it now. 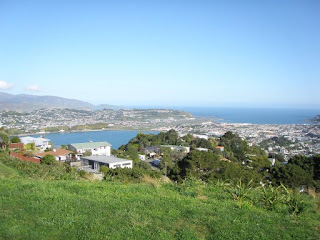 Then we went for a drive up to the top of Mount Victoria. This is looking back towards the airport. We had a great flight into Wellington as we could see the Sounds so very clearly. So as you can see, our little long weekend started well. We went over on Wed night mainly because the airfare mysteriously doubled on Thursday. Okay - we are having a great time - and it is a little cold but not that cold for all these layers of clothes we brought. 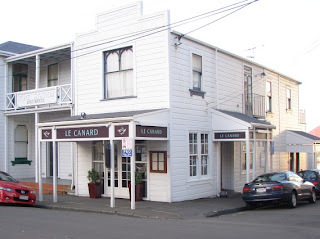 We have found 2 lovely restaurants I can recommend - Le Canard and an Italian trattoria Maria Pia's both in Thorndon. Foodies always find good places. 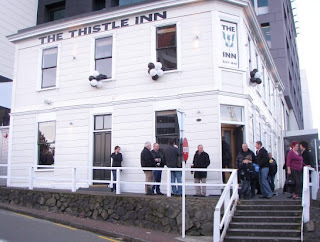 After the rugby we are off to The Thistle Inn. Got to the exhibition but not the opening! Now off to Te Papa after breakfast up in Kelburn. 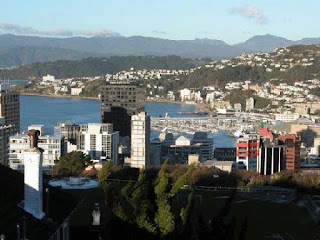 no pics today because I am an internet cafe checking my emails but here we are in Wellington with our little suitcases chocked with winter clothes and the weather has been glorious - better than Perth has been. Is this an excuse to go shopping tomorrow? 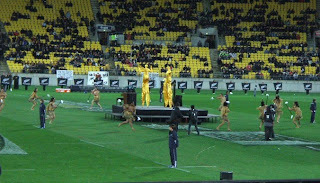 Tonight we are off to Wellington - my favourite city of all. 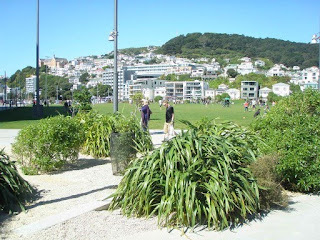 We are going to catch up with Raylene and Ken, go to watch the All Blacks (of course), maybe visit Te Papa, stroll around the city, maybe go up the cable car, breakfast in Kelburn, catch up with other friends, and generally have a relaxing time. 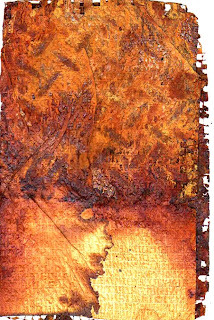 I am going to an exhibition Thursday night at Galleryspace (thanks Rebecca) and hopefully lots of other exciting things. Back on Monday night. 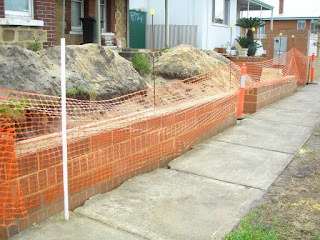 And when we get back I do believe the steps up to Grant's front door might be finished so no more mountain climbing. It's all looking good. In the meantime there is a whole day's work to be done first. I am pleased with the Starburst Sprays on each of the silk fabrics we sell. I did 2 colour sets and the sparkle on the fabrics is lovely. 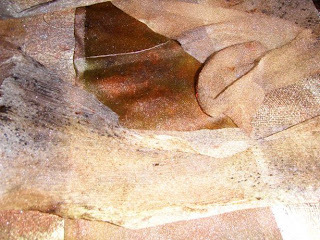 Of course the different fabrics take the colour differently but the mica is very evident in places especially the coppery ones. I ironed them all with a hot iron and I have sponged some parts with water and so far the colour is very stable. 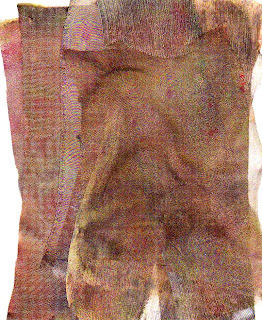 Obviously you would not be washing as a garment but being able to use these on fabrics is quite a bonus. 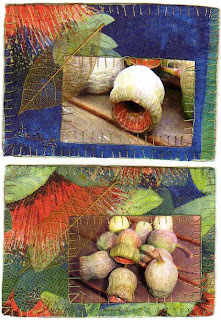 On polycotton they were rather thin but the silk loves them - and so do I.... My scanning is not brilliant - I will have to get Ian the photo man to do a better job for me. The grain in the silk noil is a bit tricky. Somehow during today my visitor list since Nov 2006 crept over 200,000. It's actually more than that because I started the neoworx counter later than when I started the blog. But it's a lot of visitors - thanks for coming by and reading my little offerings and indulging my chatter. 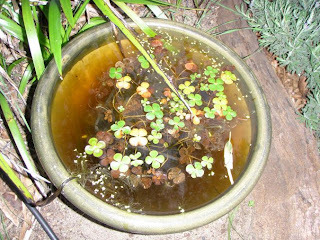 I have taken a photo of my little waterlily to show it is still pottering along - I am waiting to see if it flowers - we actually have a few bulbs out - I do like gardening but time is not on my side. If anyone knows a student or .... who would like to earn some cash weeding my front garden please let me know. 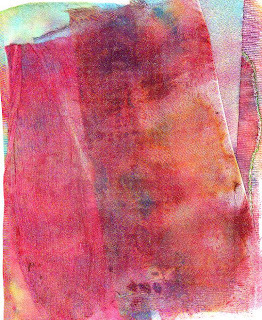 Rae sent me a pile of different silk fabrics so I could test the Starburst Sprays on them. Not a good pic but they are looking quite lovely as the mica sparkles. I shall wait with excitement to see what they look like tomorrow when they are dry. I have done a few different colourways but this one is Black Orchid Silver, Saxfridge Olive and Cocoa Bean Copper. Here are the first 6 of my little aussie goodies to go in my 10 pommie bags for Ally Pally. I have 4 more of these to make. What are pommie bags you might ask. Well, if you get the thread studio newsletter all will revealed in the October one. It is our 10th year of exhibiting at Ally Pally and this is my way of saying thank you to some of our wonderful customers wh0 come to see us there. 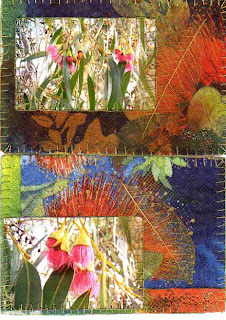 Each little pommie bag will be filled with a selection of downunder delights including these little stitched pics from me. Not long now. All the folks in Perth will know what I am saying - we are having incredible weather with big squalls passing through - naturally whenever I want to go out. Love the rain but it is so unusual for Perth at this time of the year. At least the dams must be happy. Playing with Starburst Sprays over walnut ink - so yummy. 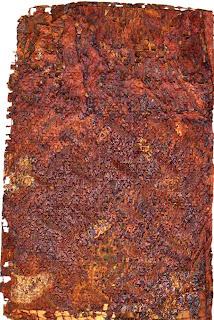 On tyvek when you heat it you get such an intense colour. 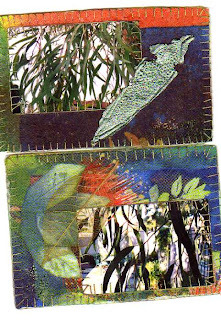 Top one is on rag paper and somehow the scanner has made my tyvek piece blurry but you get the idea. 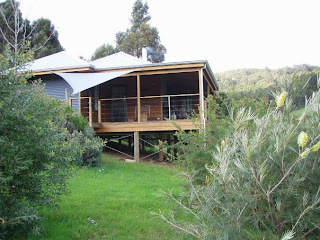 Off to Grant's to hide indoors with our yummy beef vindaloo and a new potato dish I am making - stuffed with yummy stuff. Then it can rain all it likes. Beside my bed for pre-sleep reading is Fiona's Kidman's second part of her autobiography - Beside the Dark Pool. I very rarely read autobiographies - it always seems to me that one must think a lot of oneself to want to write all about it. I am not sure about this book - while I am enjoying the historical side - Fiona Kidman is about 10 years older than me so I have followed through her writings since The Breed of Women - I was someone who coasted along behind Margaret Drabble and she is sort of the kiwi equivalent. However here I think she has a few scores to settle and we are privvy to them and I am not sure I really care. 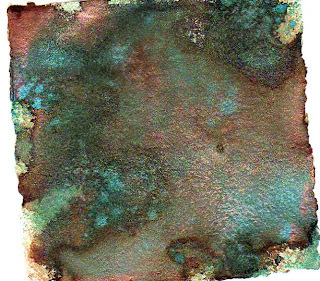 It might seem that I have been very non creative but I am working hard on the Walnut Ink and Moonglow booklets and the weather is dreadful today - wet and very windy. I slunk off to have my hair refuchsied. Happenings at Grant's house and the little mountain we climb up at night. 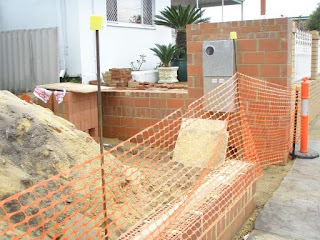 My little opening for entry - I am just not so good at climbing over fences. it will be great once it is finished. The Lincoln Street (that's on our corner) Sewer Vent, Highgate, was constructed in 1935 as a type of experiment for venting the unpleasant acid-bearing air from the sewerage system more simply and efficiently. Needless to say the experiment was hailed as a dismal failure. 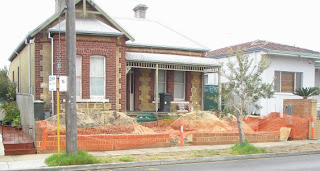 he Metropolitan Water Supply and Drainage Department under the direction of Chief Engineer of the Public Works Department, Russell Dumas (Dumas House fame), decided to build two sewerage vents in Perth, one in Subiaco and the other in Highgate. The 38m Art Deco vent at Highgate was built on the corner of Lincoln Street on the site of the Highgate Hill Police Station. A perfect location because it was high on a hill. The 38m tower included a one metre high plinth , making it the second highest tower of its kind in Australia. The tallest tower, which is 40m high, can be found in Sydney and was built in 1893.The concept behind building these towers was for the horrendously smelling air from the sewerage to filter up through the tower, into the atmosphere high above the area and blow away. It was also designed to prevent the acid bearing air corroding the concrete lined sewerage pipes . It all sounded like a great idea, but no one counted for mother nature and her thickled weather conditions. On certain days the smelly polluted air did not vent up as expected, but dispersed itself throughout the neighbourhood and the police station. It wasn't long before the residents began complaining about the foul odours. To make matters worse the vent wasn't operating adequately so the only solution for the Public Works Department was to close both towers. The whole debacle became known as the Dumas' Folly. But the experiment wasn't a complete waste of time. In 1941 during World War II the Highgate sewer tower became the perfect location to hide and camoflague the antennae used by the Police Wireless Service. The central wireless section which was used within the police force was moved from the Police Headquarters to the Highgate Police Station and the antennae placed on top of the vent (hidden from view). The location of the wireless section was kept secret at the time, as it was considered a prime bombing target after Japan entered the war. The wireless section remained at Highgate until 1975 when it was removed and transferred back to police headquarters in East Perth. The antennae are still attached to the tower. 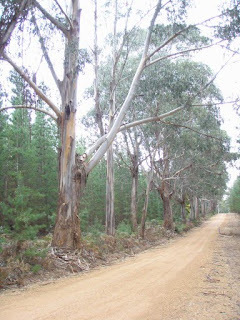 At least we always know we can find our way home if we are ever lost! We are on the other side of the two storey white painted apartment block. We are what you might call 'a bit out of our trees' here right now - stuff coming in and stuff going out and you name it. Just as well we can escape to Grant's at night where we do bit of mountain climbing to get to the front door. The spice of life. 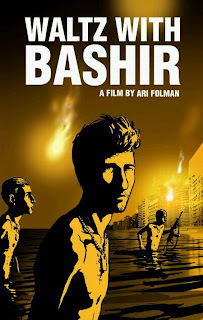 The other night we watched' Waltz with Bashir' - what a powerful and fantastic movie. It was on quite late and one of us had to struggle to stay awake but I am so pleased we sat up - we missed it when it came to the movies in Perth and I had been thinking about how we would get to see it. I rarely look at the tv guide so it must have been an omen. Recommend this to anyone. 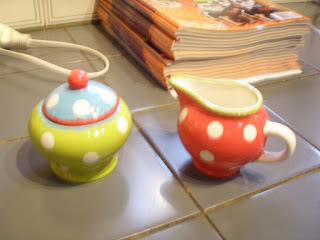 Down in Bridgetown there is a fabulous kitchen shop where I bought a new garlic crusher and this cute little sugar bowl and milk jug for taking to Grant's for Ian's sugar. Hard when you are running 2 houses - things are always at the wrong house. 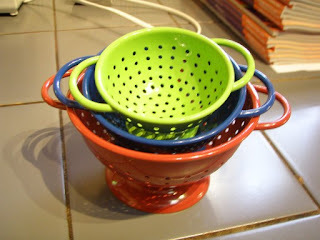 Then I saw these cute little drainers and knew they would have to come home with me too. you can see what arrived this afternoon behind the drainers - the latest Cloth Paper Scissors - the Gifts should be here too but probably tomorrow. Send them all out tomorrow. 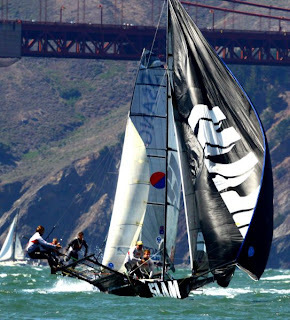 Here are a couple of photos of SLAM sailing this week in San Francisco - good life for some. 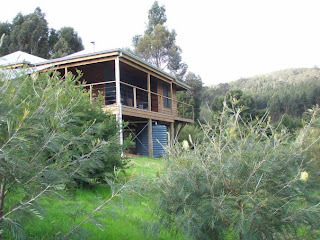 A few pics from Balingup- we stayed at Fernridge (and we did last year too) - it is a lovely place and it's nice to wake up to the sound of the cows, kookaburras, the lonely goose and lots of birds and not to mention the bunny rabbits we saw flitting away. Carol and John run a great place. It doesn't matter if it rains when you are warm and cosy indoors by the fire with your books and a good glass of red.